His speech followed a referendum in which voters called for independence. Catalan President Carles Puigdemont told Catalonia's parliament today that he has support to declare independence from Spain but asked lawmakers to wait several weeks in order to allow for dialogue with Madrid. "The effects of the independence vote have to be suspended while we seek a dialogue," he told lawmakers. Puigdemont and dozens of other lawmakers signed what they called a "declaration of independence" from Spain Tuesday night. The "Declaration of the Representatives of Catalonia" refers to the Catalan republic as an "independent and sovereign state" and affirms "the will to open negotiations with the Spanish state without preconditions," according to a copy of the document published by local newspaper El Pais. Catalonia, in northern Spain, had braced for a momentous climax to its bid for self-rule today, as some expected Puigdemont to declare independence during his speech to the regional parliament. Today, Puigdemont called for a calming of tensions after an Oct. 1 independence referendum, in which Catalans overwhelmingly called for independence. That vote, which Spain's government in Madrid has rejected as illegal, was marred by violence, with hundreds of people injured in clashes with Spanish police. For its part, the Spanish government called an emergency Cabinet meeting for Wednesday but has not given any indications it is open to dialogue. The Catalan leader "doesn't know where he is, where he is going and with whom he wants to go," Spanish Deputy Prime Minister Soraya Saenz de Santamaria said. A spokesperson for Spanish Prime Minister Mariano Rajoy said Monday that Puigdemont could be jailed if he declared independence. The area around parliament in the regional capital, Barcelona, was blocked off to the public today after hundreds of thousands of people attended demonstrations over the past week for and against independence. 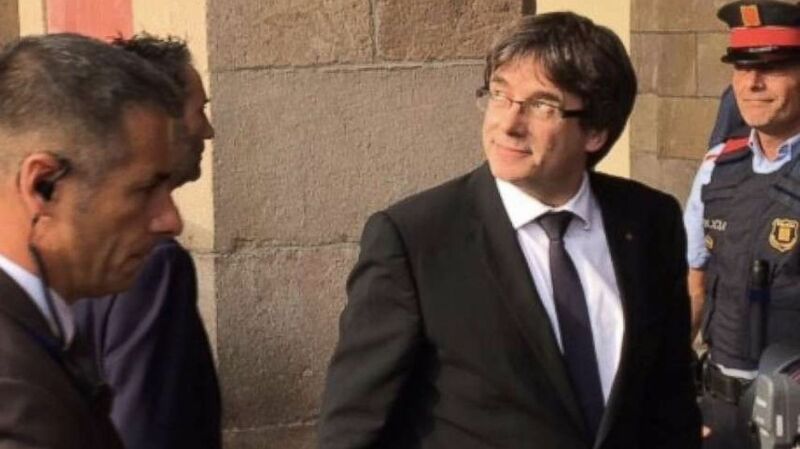 As Puigdemont arrived this evening, he glanced toward the sky as a Spanish helicopter flew overhead. "We don't know what to expect," Salvador Illa Roca, secretary of the Socialists' Party of Catalonia, which opposes independence, told ABC News before the speech. "We are asking for respect of the law." Going into today's session in parliament, Puidgemont had several options. He could have declared independence outright. Or he could have called for new local parliamentary elections to ratify the results of the referendum and go forward with a united front, although that route was rife with risk and he could have lost support if elections took place. In the end, he reiterated what he said on the night of the referendum: that Catalonia had gained the right to statehood but that a formal declaration should be delayed while negotiations with Spain take place. (Aicha El Hammar/ABC News) Catalan Regional President Carles Puidgemont glances at a Spanish helicopter flying overhead as he arrives at the Catalan regional parliament building in Barcelona on Oct. 10, 2017. Joan Maria Picque, a spokesman for the Catalan government, earlier dismissed concerns about the risks inherent in a declaration of independence. "George Washington was probably asked the same kinds of questions," Picque told ABC News before Puidgemont's speech. "This is our time. It's 1775 for us. And we are going to get to 1776." The forces at work are complex, ranging from the loss of faith in Madrid's elites after the financial crisis to Rajoy's hard-line stance and bitter policy battles over taxes, budgets and local control. In Catalonia — which has its own language, history and culture — residents who support breaking away from Spain often speak of maintaining their dignity. Spain's central government has sometimes suppressed the region's language and culture. Many Catalans believe Madrid has never truly respected them as equals. Puigdemont has found himself under tremendous pressure. The government of Spain threatened to seize control of his government if he made the declaration. That move, allowed by the Spanish Constitution and dubbed by some as the nuclear option, would likely have led to the arrest of top officials and the seizure of the parliament and other institutions and could have triggered violence. Businesses in Catalonia — Spain's richest region, responsible for one-fifth of the country's GDP — have pushed back against the independence bid. Big banks have moved their legal headquarters out of the region, and foreign investors have threatened to pull out. Meanwhile, much of the infrastructure in Catalonia — power, transportation and communications — is in the hands of Spanish companies. A spokesperson for the Spanish Interior Ministry told ABC News that members of the national police force remained in Catalonia. "We are ready to intervene in case of big protests," the spokesperson said. Nuria Trapero, a 24-year-old waitress in Barcelona, told ABC News that Catalans had spoken when they voted for independence and that the Spanish authorities should respect their wishes. "I am preparing myself to go back in the streets," Trapero said before Puidgemont's speech. "We will see after the parliament session." Jaume Verdaguer, a 37-year-old unemployed man in Barcelona, told ABC News he was "neutral" but added that "we all hope secretly we will win independence." He said, "It's an important time for us, and if it's not today, we will have to wait again another generation — 30 or 40 more years." ABC News' Ben Gittleson and Kaelyn Forde contributed to this report.